First of all, don’t be afraid. 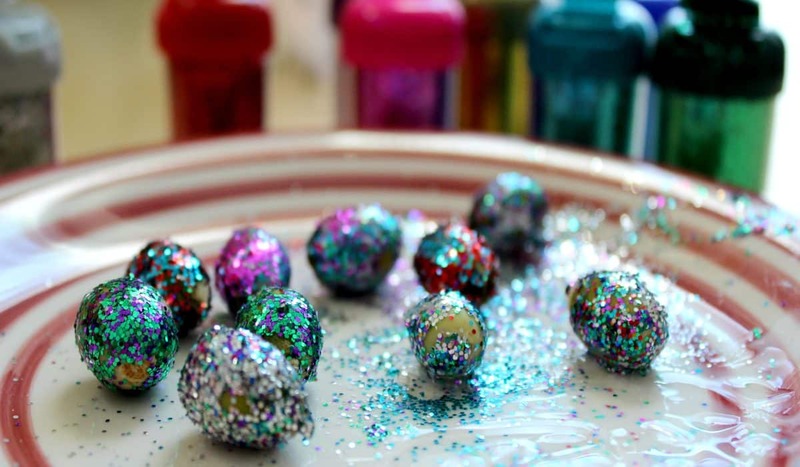 This nature craft does involve glitter (and lots of it) and guess what? It doesn’t have to end up embedded in the carpets, over the furniture or stuck to the babies scalp (this may have happened on more than one occasion). It can be controlled and I am going to show you how to embrace the sparkles. 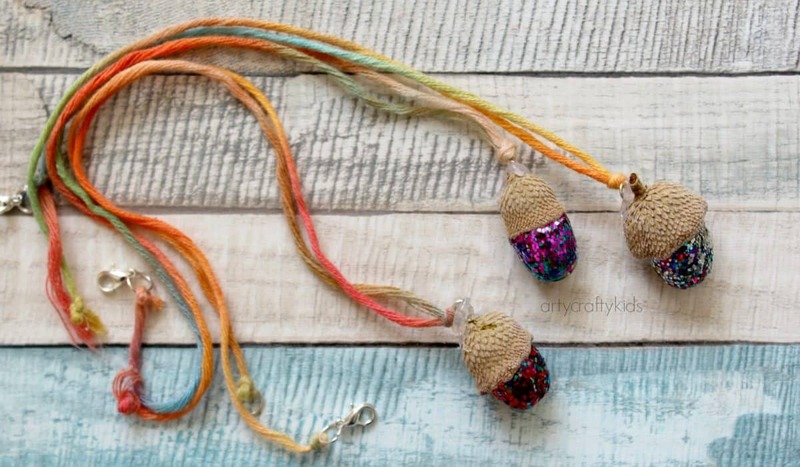 Because, let’s face it, these adorable acorn necklaces is one kids nature craft you don’t want to miss! It all starts with a wonderful nature walk. A play and a rustle in the leaves. A scavenger hunt that includes a pocket full of acorns. You return home, make a cuppa and get started…here’s what you need! This is the kids bit and probably the scary bit, as they’re about to be let loose with the glitter! To start, smother the acorn with PVA Glue and then place it into a plastic bowl. 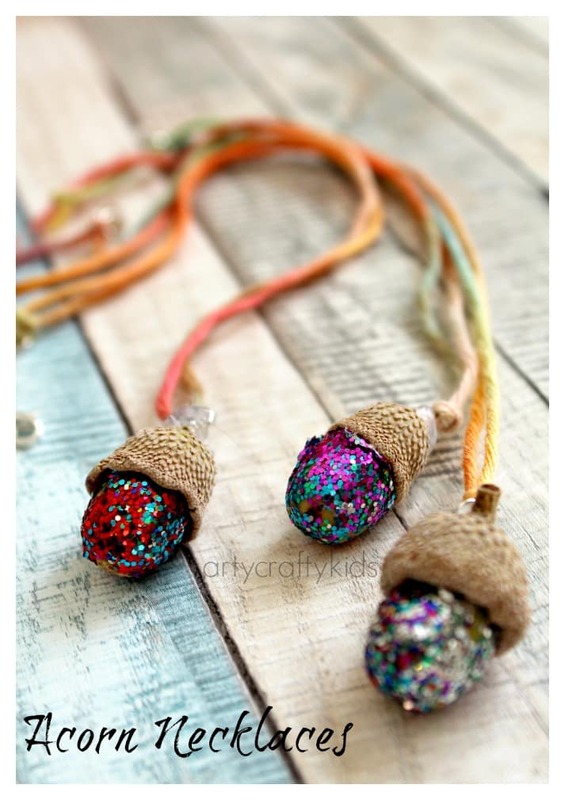 Using shaker bottles, cover the acorns with a gorgeous sparkly glitter coating. 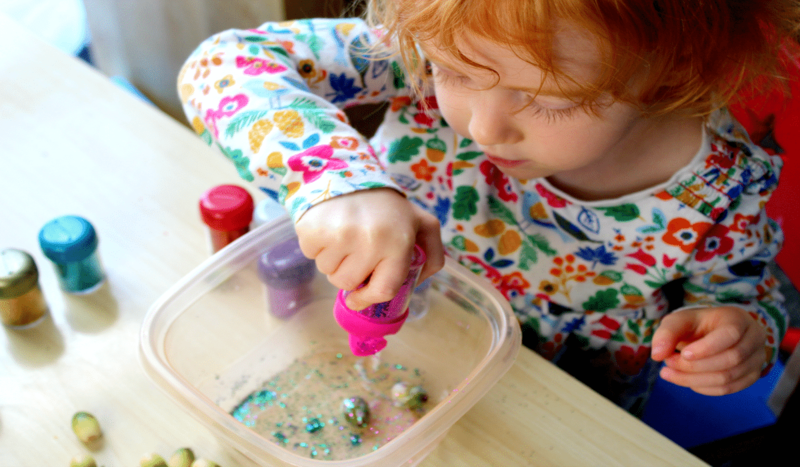 Shaker bottles, for me, make crafting with glitter possible. Kids are able to control the flow of the glitter and for this craft, the glitter flakes are slightly larger than usual and seem to stick to the surface without leaving a sparkly trail. With the addition of the bowl, my preschooler was more than happy to apply the glitter within the boundaries and of course, this kept the glitter under control! Once the acorns are covered with glitter, leave them to dry! 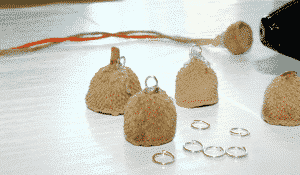 While your crafty kid is busy with the sparkles, stick a split ring to the top of the acorn cap using a hot glue gun. 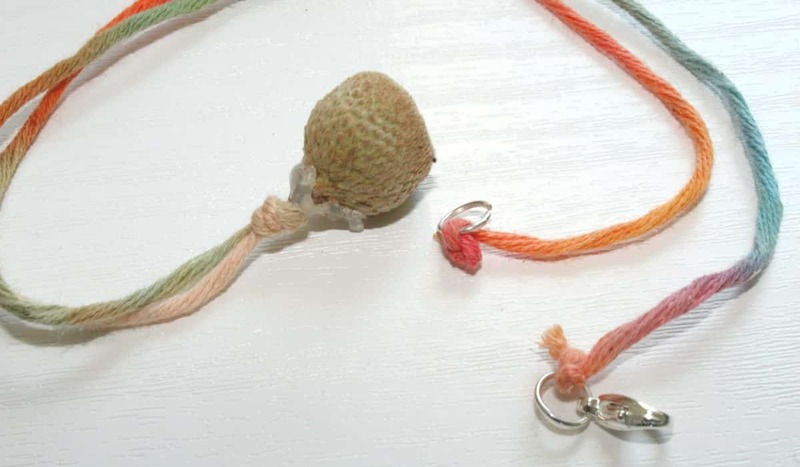 Once the glue has dried (this will happen very quickly), thread the yarn or cord through the single split ring and attach two more to each end of the thread, along with a single lobster clasp. TIP: You may need to use the a pair of pliers to close the split rings! 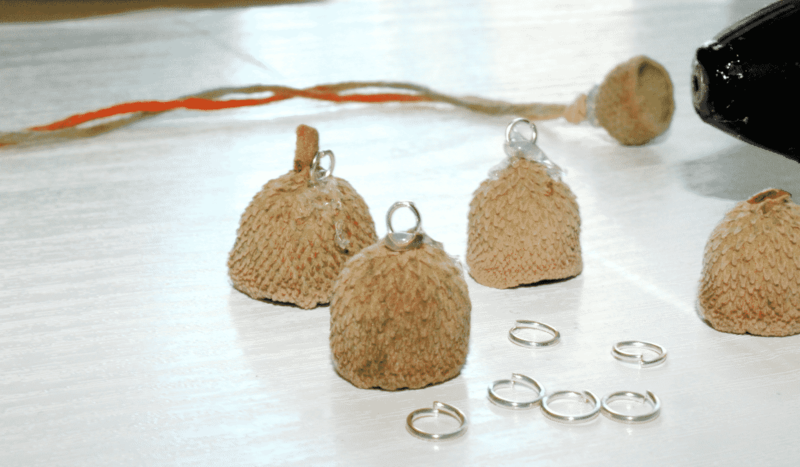 If you would prefer not to use split rings and a lobster clasp, simply use a longer piece of thread and secure the ends with a knot. Pop the acorns into the acorn cap and that’s it! 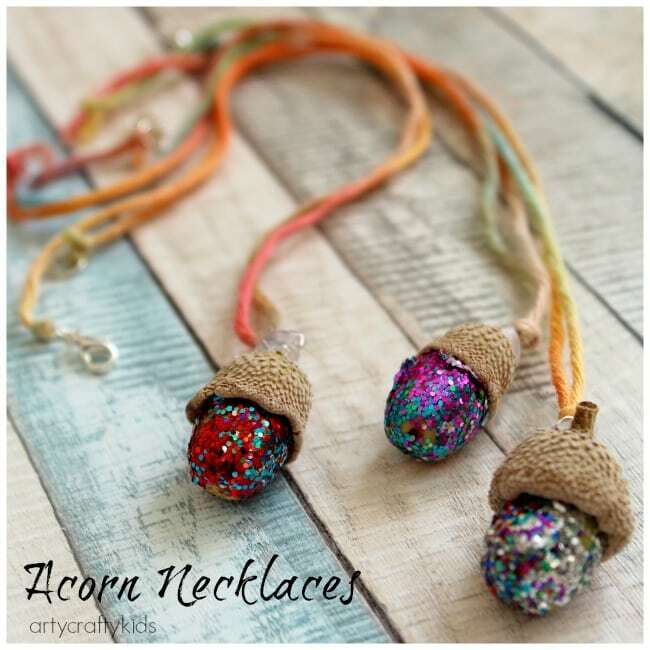 Your kids should now be able to adorn themselves with their gorgeous acorn necklaces. 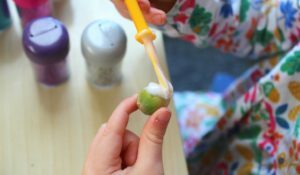 What I love about this kids nature craft, is that it is one to do alongside your kid and I for one relish the opportunity to work together on projects, although my kids wouldn’t let me near the glitter! 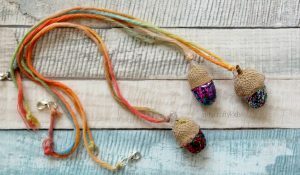 While I would love to claim this wonderful idea as entirely my own, our acorn necklaces were inspired by Rhythms of Play’s gorgeous acorn marble necklaces and I encourage you to check them out and have a good look around Nell’s inspiring blog. Before you do that, be sure tp SIGN-UP to our newsletter to receive regular updates of our latest posts!